Flutter Tabs Tutorial | Working with Tabs Example is today’s topic. Working with tabs is a typical pattern in Android and iOS apps following the Material Design guidelines. Flutter includes a very convenient way to create tab layouts. For tabs to work, we will need to keep the selected tab and content sections in sync. It is the job of the TabController. Our example app has a screen which contains a tab bar with two screens. To add Tabs to the app, all I needed was to create TabBar and TabBarView and attach TabController to them. TabController will sync TabBar with TabBarView so we can have behavior we wanted. 2 Step 1: Install the Flutter App. 3 Step 2: Create two screens. Using the DefaultTabController is the simplest option since it will create the TabController for us and make it available to all descendant Widgets. The syntax of DefaultTabController is following. child: // See the next step! Step 1: Install the Flutter App. If you are new to flutter and do not know how to install flutter on the mac, then check out this article. After that, if you do not know how to write a widget in the flutter, then please go to this link. Step 2: Create two screens. Inside the lib folder, create one folder called screens and inside that create two files. Write the following code inside the FirstScreen.dart. In the above code, we have just added one centered text. When the user clicks on the first tab button, we will see this screen. Write the following code inside the SecondScreen.dart. This is the second tab layout. So we have created the two tab layouts for our application. Now, the remaining thing is to create a DefaultTabController. Write the following code inside the main.dart file. In the above code, we have imported two screens which are created earlier in this article. Our application has only two tabs. So, we have assigned a length to two. Then, we have taken the TabBar and assigned two tab icons. Now, let’s define the TabBarView which have two screens. So when the user clicks on one of the icons, it will display the associated the Screens. Save the file and go to the terminal and type the following command. Please make sure that both iOS and Android Simulators are open. We will check the output on both the Virtual Devices. 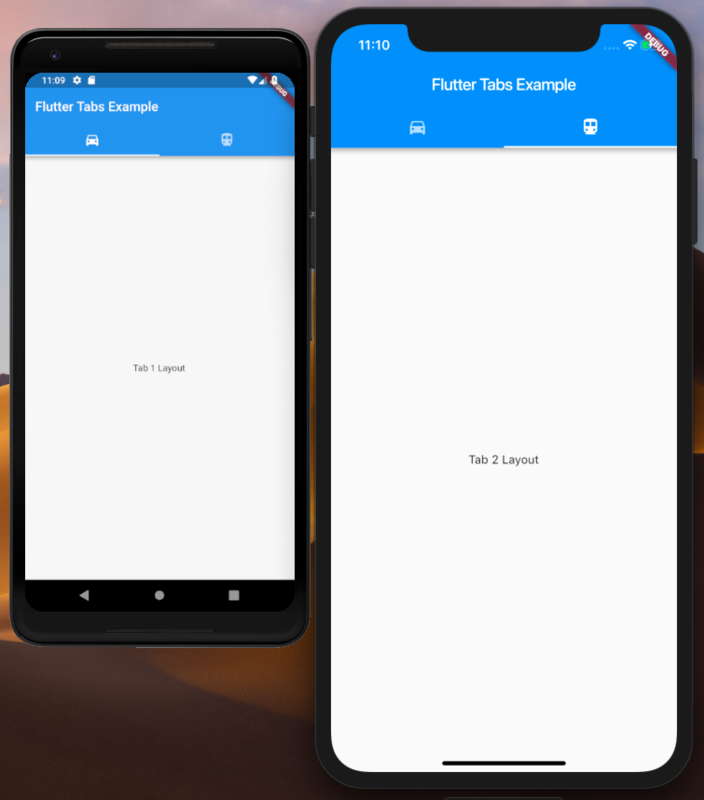 Above app is the basic Flutter Tabs Example, but you understand how we can build a Tab based layout in Flutter Application. Finally, Flutter Tabs Tutorial | Working with Tabs Example is over.